Warren Weinstein family statement: U.S. handling of case inconsistent and disappointing. 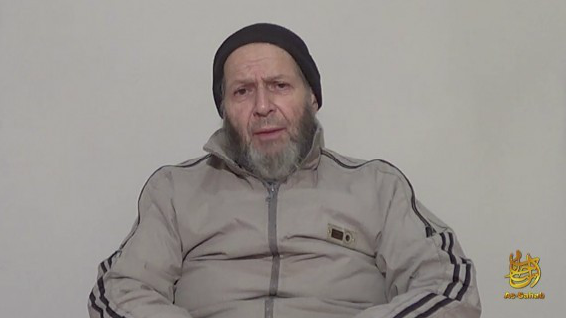 Warren Weinstein in a 2013 video distributed by his captors. A statement released by the family of Warren Weinstein—one of the two al-Qaida hostages believed to have been killed in January by an American drone strike against a target in Pakistan—is critical of the American government’s response to his abduction and says his death should “finally prompt the U.S. Government to take its responsibilities seriously and establish a coordinated and consistent approach to supporting hostages and their families.” Weinstein said he felt “totally abandoned and forgotten” in a video released in 2013 by his captors. Weinstein was kidnapped from his home in the relatively secure Pakistani city of Lahore, where he was working for a private contractor employed by the U.S. Agency for International Development, in 2011. He was Jewish. “Those who took Warren captive over three years ago bear ultimate responsibility. I can assure you that he would still be alive and well if they had allowed him to return home after his time abroad working to help the people of Pakistan. Weinstein was a Maryland resident, and the statement thanks his local representatives for their work on his behalf before criticizing others. The statement says Weinstein “loved and respected the Pakistani people and their culture” and had learned to speak Urdu. *This sentence was updated to include information about Caitlan Coleman.